Evening Shows start at dusk (about 8:00pm) with seating beginning at 7:00pm. Sunday Matinee starts at 4:00pm, seating to begin at 3:00pm. NEW! Reserved Seating available! On-site catering from Roswell's The Fickle Pickle is offered to our reserved seating patrons. Performances will be presented on the property of Barrington Hall in Roswell, Georgia. The Hall is located at 535 Barrington Drive, on the south side of the Historic Roswell Square, near the intersection of GA Hwy 120 and GA Hwy 9. 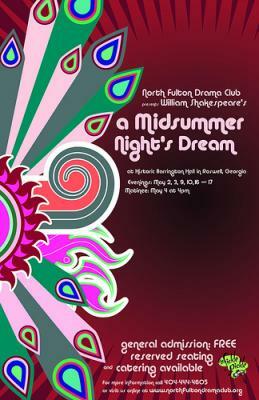 For further information, please visit us at www.northfultondramaclub.org. You can email us at nfdramaclub@gmail.com or call Thomas Strickland at 404-444-4605.